The Rajah III is the smallest of the gurkha knives Cold Steel produces. All knives in the Rajah series were designed by Andrew Demko and are built to have both the feel and the function of the traditional kukri. Even though the cutting edge is just 3.5 inches long and the knife weighs only 4.4 ounces, the forward-weighted blade and the machete-style handle let the Rajah III swing and chop as well as thrust. You'll find that the S-curve of the knife's plain edge grabs and slices rope and harness straps quickly by drawing the edge of the knife deeper into the cut. Cold Steel uses AUS8 high carbon stainless steel in the knife blade along with solid steel liners and a handle of Grivory. This synthetic material often substitutes for metal parts in the automotive industry and resists heat and chemical action. Other technical improvements include one-handed opening via a flat thumb plate at the base of the blade. The knife opens either right or left-handed. Catching the thumb plate on the lip of your pocket also swings the blade open. Cold Steel improved the locking mechanism of this lockback knife, so the catch no longer depends on perfectly matching bearing surfaces. The new Tri-Ad lock seats against a stronger steel locking pin instead. The 8-3/8-inch-long Rajah III folds into a pocket-sized, 4-7/8-inch handle with mountings for the stainless steel pocket clip on either side. Mount the clip for either right-hand or left-hand carry. 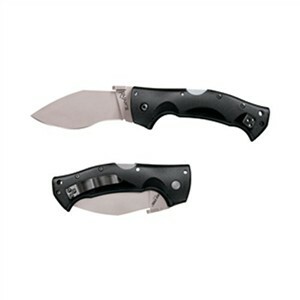 See the Gerber Applegate Fairbairn folder for a pocket clip knife in the British style.